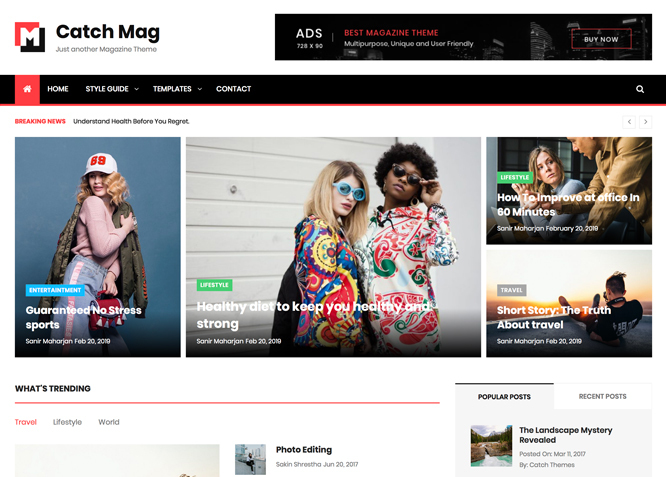 Catch Mag is a responsive and visually appealing multipurpose magazine WordPress theme that is completely free of cost. It comes with powerful customization features. 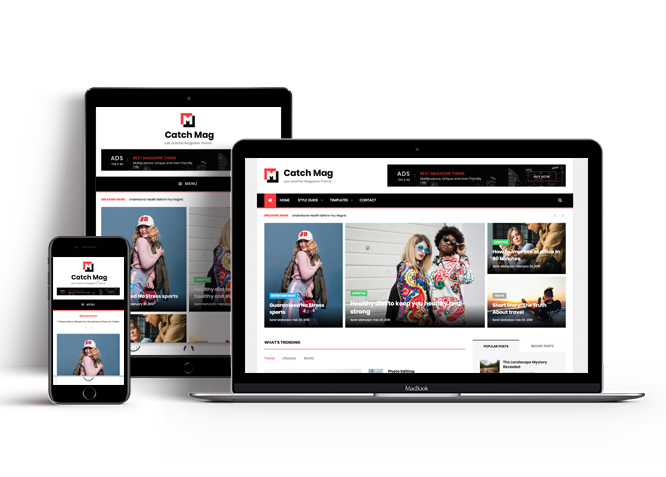 Although Catch Mag has been designed especially for magazines, its vast range of features makes it adept to be used in almost any platform. It is a very lively and purposeful theme that comes with a creative outlook, making it wholly compatible with a range of diverse usages. The theme is jam-packed with powerful customization options at your fingertips; this will help you build a completely unique magazine website. Crucial features such as featured two columns, header highlights, news ticker, portfolio, service, team, testimonials, top reads, and more have been encompassed in this theme. This theme ensures your content is delivered in an appealing and eye-catching way that keeps your audiences affianced. For more advanced features, check out the premium version – Catch Mag Pro. Catch Mag offers exciting Menu Options! This theme supports and recommends using "Custom Menus". You can create Custom Menu through "Appearance => Menus" from your WordPress Dashboard. Catch Mag supports 5 featured content types to choose from: 1. Post, 2. Page, 3. Category and 4. Custom. 5.Custom Post Type(requires Essential Content Type Plugin ). For Featured Content Options, go to "Appearance => Customize => Theme Options => Featured Content"
Catch Mag supports Page as Featured Two Columns. For Featured Two Columns Options, go to "Appearance => Customize => Theme Options =>Featured Two Columns". Catch Mag supports Page as header highlights. For Featured Two Columns Options, go to "Appearance => Customize => Theme Options => Header Highlights." Catch Mag supports Page as Hero Content. For Hero Content Options, go to "Appearance => Customize => Theme Options => Hero Content Options". 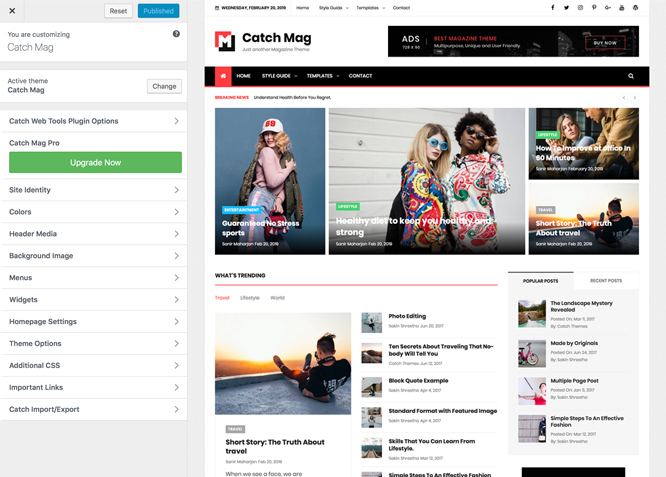 Catch Mag has 2 Default Layout, 2 Homepage/Archive Layout to choose from "Appearance => Customize => Theme Options => Layout Options"
Catch Mag supports Portfolio types to choose as Custom Post Type. Catch Mag supports Custom Post Type as Service. Catch Mag supports Custom Post Type as testimonials. Catch Mag supports top reads, there might be some news, gossips, or information which a large number of the audience might enjoy reading. Those type of articles can be featured in the Top Reads section. Use your Top Reads section wisely; it can help you attract many new visitors. You can choose the Top Reads content as Page. There are also a number of other customization options available which are described below.